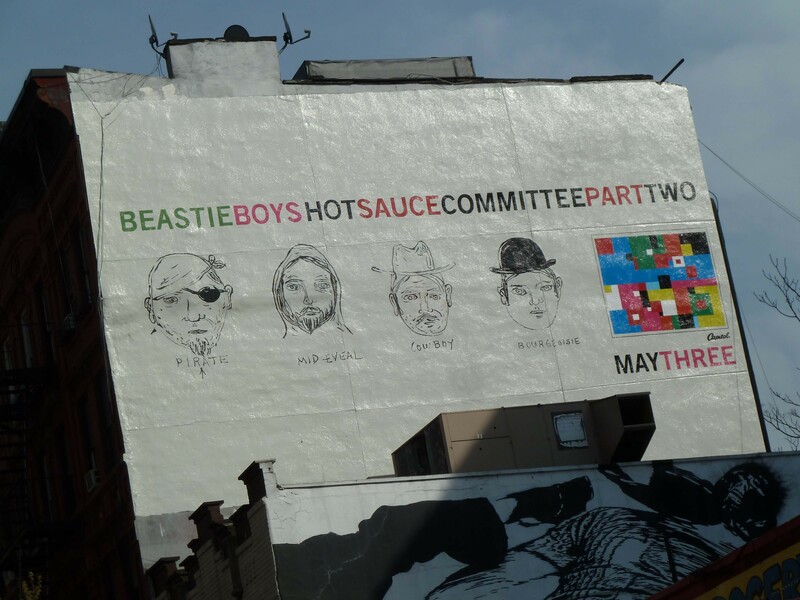 Once again my friends the Beastie Boys are back with Hot Sauce Committee Pt.2 and not a moment to soon. Hot Sauce Committee Pt.1 was scheduled to be released in December 09, but was delayed indefinitely due to Adam Yauch (MCA) being diagnosed with throat cancer that same year. Over the next year MCA went through surgery and has made a full recovery, still “callin out your people like a casting call“. He sounds amazing on the new album. As for Hot Sauce pt 1, Yauch was quoted in 2010 saying “We finished the album over a year ago, so we want to take a look at it and re-evaluate to make sure it’s what we want to put out there and that we are still happy with it, I don’t think we will change it too much”. So Pt 2 is the culmination of 2 years of work, one huge delay, and a little refinement. The end result the best B-Boys album in years, smashing “Hello Nasty” and “To the 5 Boroughs” to pieces. New York’s iconic trio held nothing back on the new project, it’s a 16 track roller coaster with no brakes, but plenty of breaks. This album leaves your head noddin and when it’s over you want to get right back on that ride. Dropping a little bit of the quirkiness, the Brothers Beastie are back to the trademark bravado and funk that made them the kings of their very own sound. Nas and Santogold drop through to add some extra doses of flavor, and B-Boys #4 and 5 Mix Master Mike on turntables and Money Mark on keyboards shine as always. Mix Master Mike works his magic throughout the whole album, sometimes subtlety sometimes undeniably, even on the raucous punk track “Lee Majors Come Again” where you wouldn’t think turntables would fit but Mike’s musical mastery works it out beautifully. “Here we go again givin more, nothing lesser/back on the mic is the anti-depresser” shout Adrock in the kick off single called “Make Some Noise” which also is the first video release from the project. More of a short film directed by Nathaniel Hornblower (MCA’s eccentric alter-ego) this 30 minute mini movie is an elaborate “prequel” to the bands historic “Fight for Your Right” video. Packed with too many comedians and movie stars to mention, and it debuted at the Sundance Film Festival earlier this year, it’s hilarious and fresh to death at the same time. My favorite cameo is Chloe Zevigne in the limo with a surprise for “Adrock” played by Elijah Wood wanna see it, here it goes. It’s fair to say,through some adversity the Beastie Ballers have got their Licence to Ill freshly renewed for 2011. To get your dose of extra hot sauce, you can find all types of swag including vinyl, T- shirts, downloads and some surprises here.